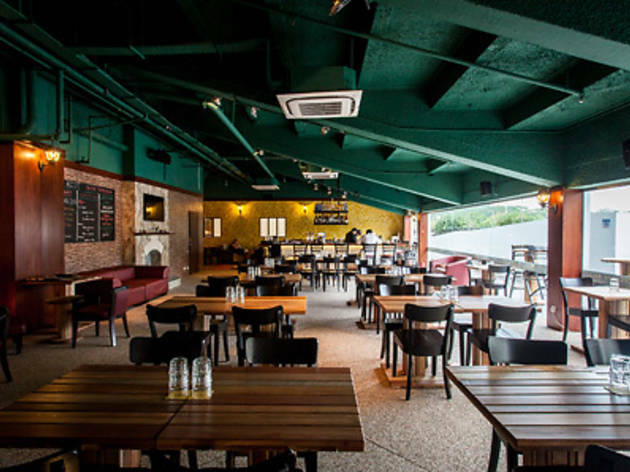 Classic British food meets Indian curries at The Ascot, whose Singaporean owner Sylvester Fedor spent two years studying in the UK and aspired to recreate the quintessential pub experience. 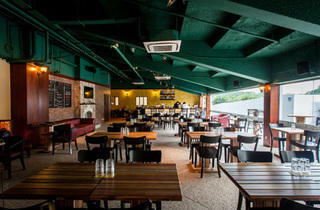 Putting up at the The Grandstand where parking is plentiful and the food options varied, Ascot’s semi alfresco concept (100 seats), laidback bar vibe and football-friendly TV screens spell good news for a guys’ night out. Dinner isn’t too shabby either – a strawberry spinach salad with blue cheese ($18) is a nice prelude to the bunch of bangers, three broiled sausages on truffle mash and drizzled with onion gravy ($20). While you can also choose from two Indian curries, chicken tikka masala and fish korma (both $18) in a nod to London’s Indian expat population. Brunch is served on weekends and there’s also the Sunday Roast, a popular Northern England tradition when you get to pick your choice of roasted chicken, pork ribs (both $28), lamb or beef ($32), alongside a Yorkshire pudding and free-flow of sautéed vegetables and potatoes – you can’t get any more British than that. There are free shuttle buses to The Grandstand from Toa Payoh, Newton and Botanic Garden MRT stations.